This Ku mask- Tiki of strength war healing and much more... is 36 inches tall and 10 inches wide made out of Acacia Koa wood also known as Monkey Pod giving a natural brown and beige color. This Tiki mask has been hand rubbed with oil to give a beautiful and smooth finish. 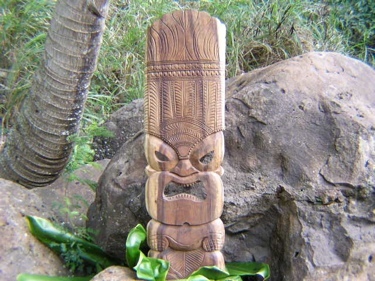 Great Tiki mask for INDOOR or OUTDOOR! This Tiki mask was carved with great attention to details. Its a beautiful piece of art!